EU Sizes 20 to 36. Hand made of genuine waterproof leather with 100% sheepskin lining. Appropriate for cold dry weather. OUTSIDE: The boots are made of waterproof (hydrophobic) leather. Please note that this dry cold weather model is not water-resistant as the seams are not welded or taped. The boots may only withstand brief and reasonable exposures to light rain, splashes and/or shallow puddles before water gets through on the inside. LINING: Sheepskin (fur lining) provides excellent insulation against low temperatures and absorbs moisture. Note that we cannot determine the recommended temperature range for usage, as it will vary for different body and activity types. SOLE: Lightweight, flexible sole, with good grip and shock-absorbent quality. 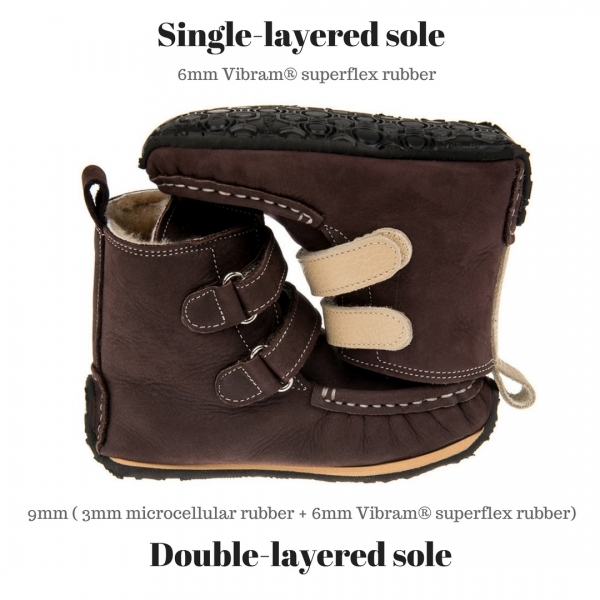 1) Double-layer sole - 9 mm thick, consists of 3 mm microcellular rubber and 6 mm Vibram® superflex rubber. This option has better insulation. 2) Vibram® superflex rubber - 6 mm thick. This option's feel is best for a barefoot feeling/walking feel. SYMBOL: If you would like a symbol on the boots, please order from among the symbols in this product. 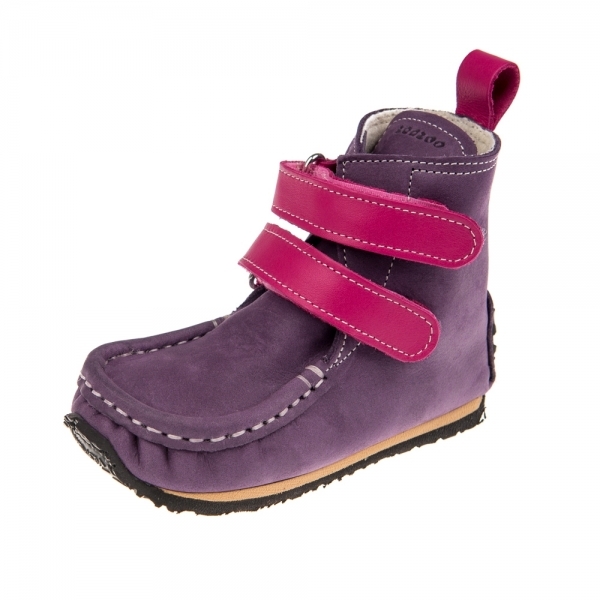 ADVANTAGES OF THE MODEL: Based on our moccasin model, these boots feature incredible comfort without stitching and edges to press on and injure the little/tender feet of your child. All edges and contours have been hammered in or pointed outwards so the model would embrace the feet both fully and gently. 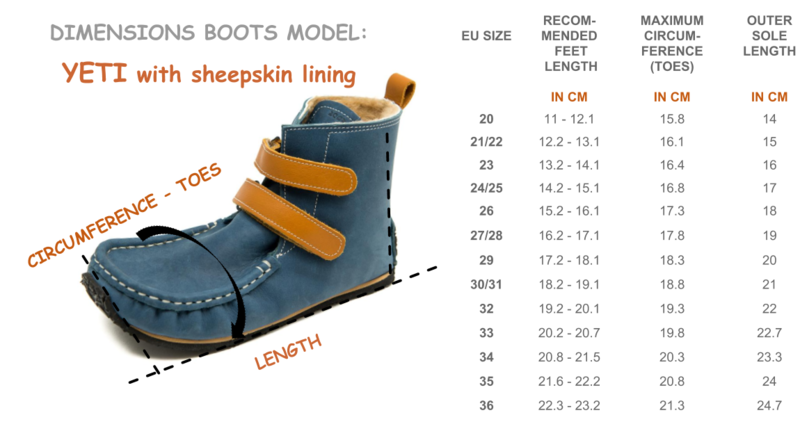 Our boots gratify the needs of the growing kids' feet. 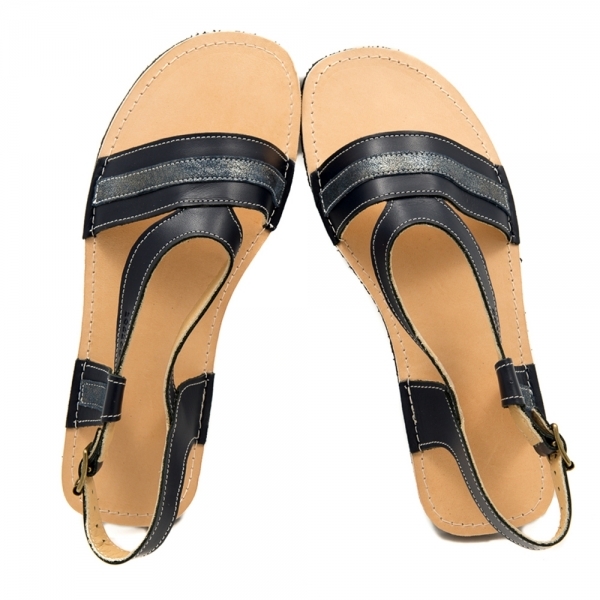 The flexible sole and shoe construction has been specifically designed for the best rendition of a barefoot walking as close as possible to the real feeling. Children boots must not limit the free movements of the growing feet, nor deform, press on and constrict them. AIR CIRCULATION: Your kid can use this footwear with or without socks. The air circulation is very good and provided by the 100% natural leather and natural wool which allow the feet to breathe. ATTENTION: Not appropriate for rain or snow. Not fully waterproofed. The handmade stitching can wear out if there is heavy use with toys such as bobby cars, bikes without pedals, or other toys and games where kids may be dragging their feet. * Width: Please choose between the 2 width options from the drop-down menu. The WIDE width is "+10 mm" more than the circumference in the column "MAXIMUM CIRCUMFERENCE (TOES)", as it concerns the top leather part width only, not the sole. We do not correct the sole width. If the feet are significantly narrower -> more than 1.5 cm less than the maximum circumference in the last column, please contact us for advice. We can make customization of the width (- 1 cm), which we produce by hand for a €10 fee. You can make this additional payment here. Products with correction in the standard sizing options are not subject to our standard return policy. I have loved yeti shoes useing by my child with sheep skin. And the flexibility is so nice. Thank you making so nice shoes!